I am interested in landscape, its influence on humans and their impact upon it through time. I like to explore these issues through my personal landscape and its influence upon me. Change is constant and its impact upon the landscape is stark. The global cycles that create what we see around us are referenced in my work by the process of creating a wood-fired ceramic object. In every piece there is creation and destruction. The metaphoric relationship between the geological process and the ceramic process is integral to my work. Through my work I reference places that have significance to my life within the landscape. I intentionally source my own local materials, using them unrefined to show my personal relationship with the landscape, the materials within it and my past experiences from where they were collected. 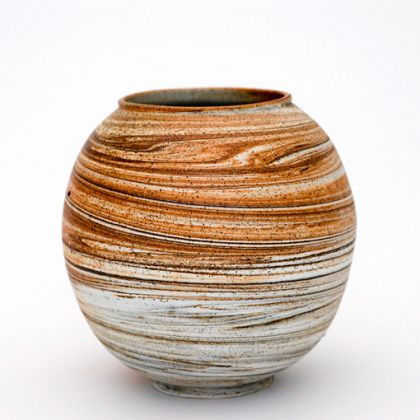 Moon Jars are a Korean form from the Choson dynasty (1392-1910) originally made from plain white porcelain. At the time they represented the epitome of austere Confucian taste. I was struck by their serenity and simplicity. I decided to use this pure form as a canvas adding glaze, texture and materials from the landscape to create contemplative pieces of personal significance.